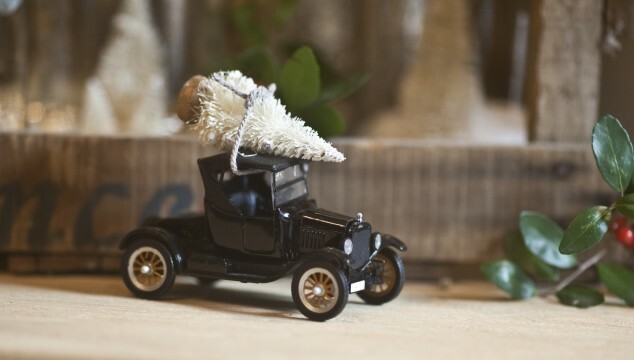 Bottle brush trees give your Christmas decor a vintage vibe and I just like them. I don’t know why; I just do. 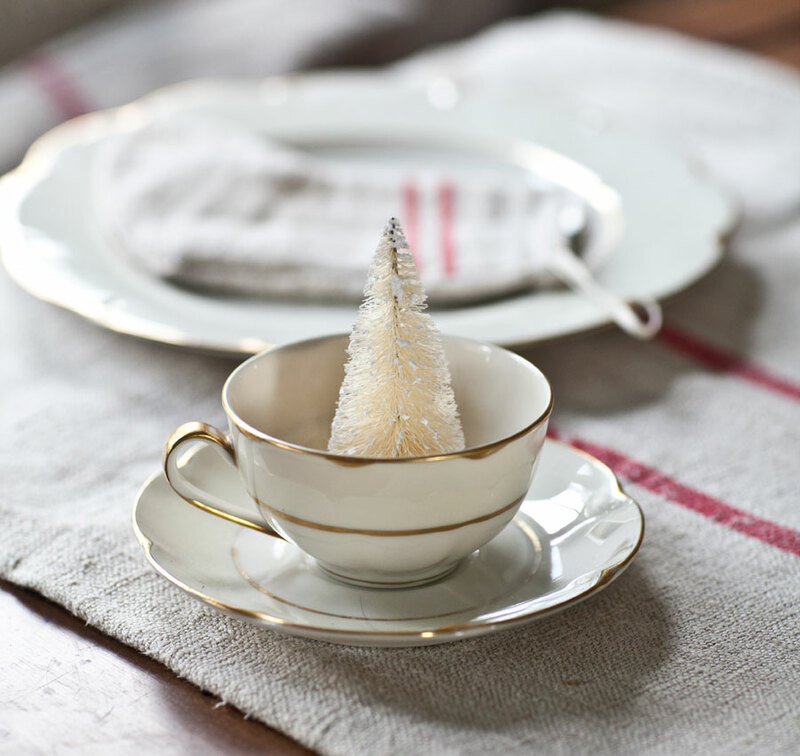 So I thought I would reveal 6 ways I’ve used these trees in my own Christmas decor. I guess technically the trees should be outside the house and not inside, but this works for me. 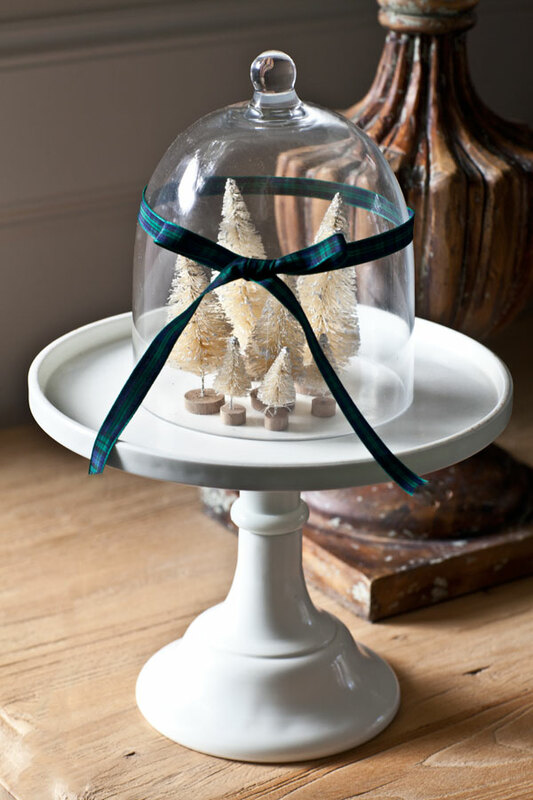 These are small little trees in a petite cloche. 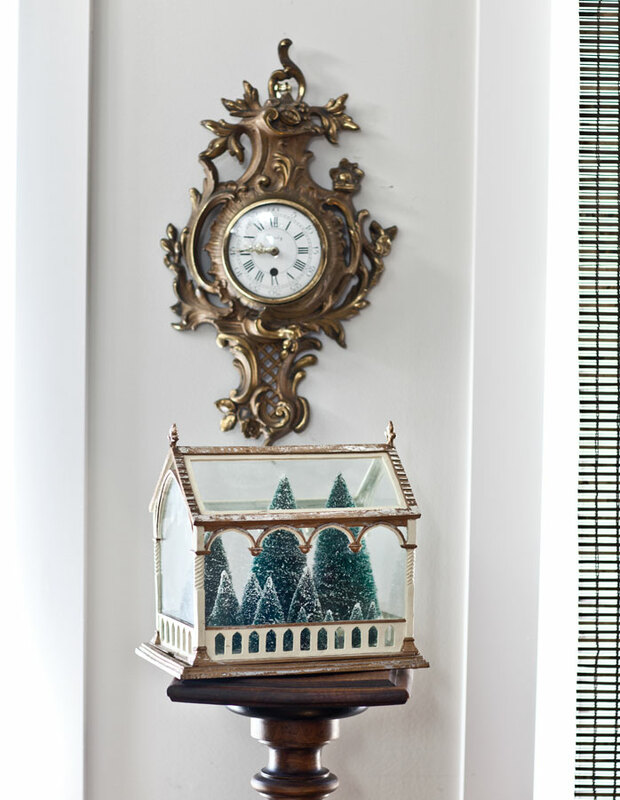 Or you could use larger trees in a larger cloche, like this one shown below from a luncheon I had a few years ago. CLICK HERE TO SEE MORE. These trees are on a marble cutting board. 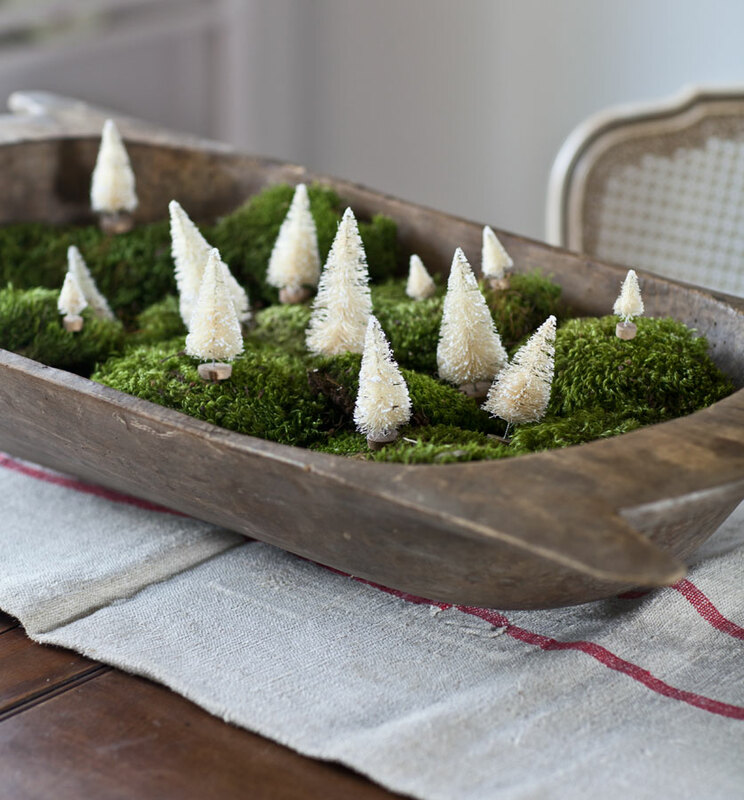 But you could also put trees on a large wood bread board like the one shown below. Here I have the trees outside the house where they belong! 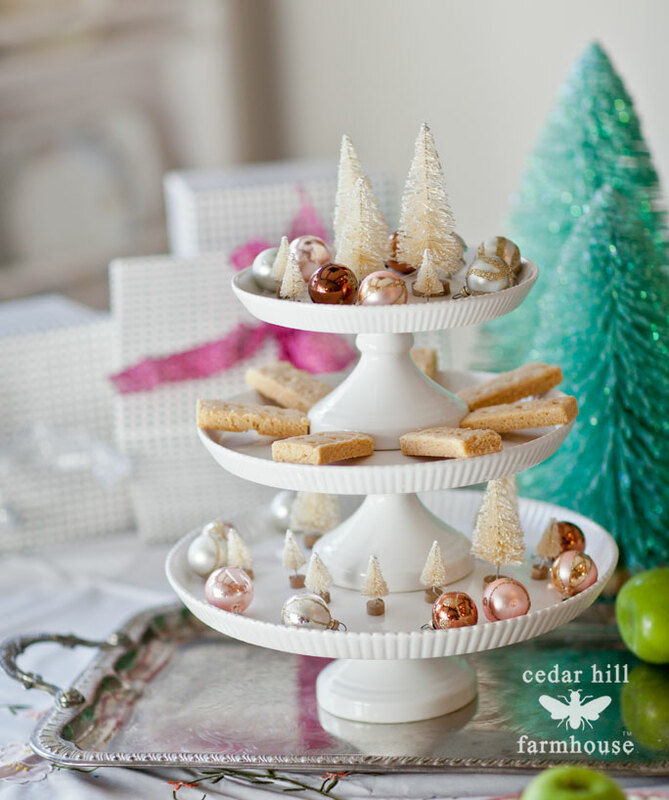 The bottle brushes on the cake stands look so festive with the Scottish shortbread shown, CLICK HERE FOR MORE. 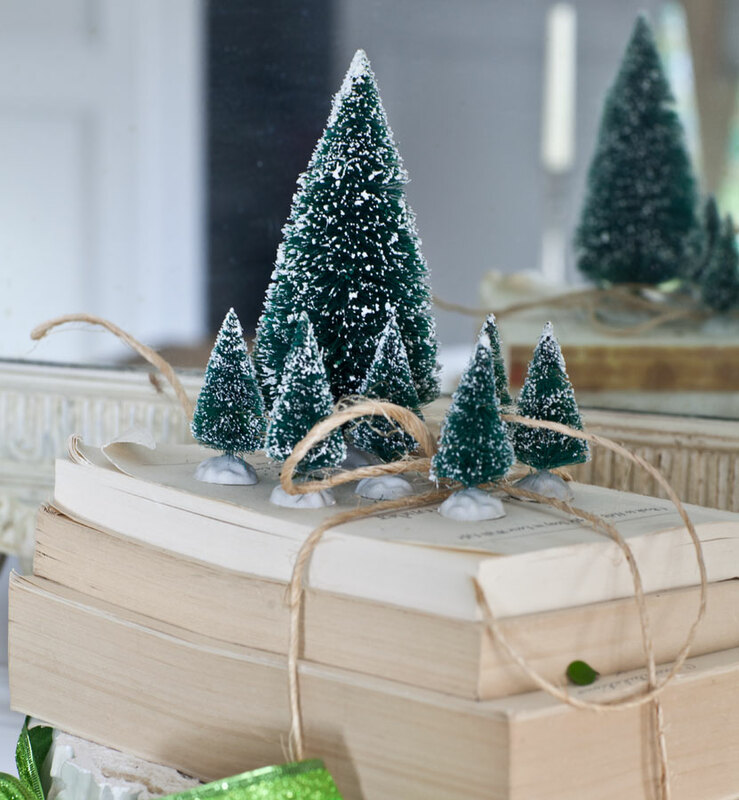 You can use the trees to make your own homemade snow globes, CLICK HERE FOR MORE. 5. On top of moss. Here I have recreated the Scottish Highlands (from Outlander) with moss in the dough bowl, and I added the white trees on top. I just need a little Jamie and Claire dolls to add to the mix. Sorry I have the giggles, and that makes it difficult to write a serious blog post. These trees are set on top of several books tied with twine. 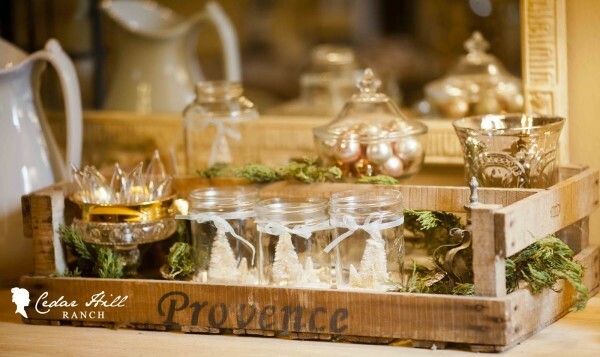 You can also use the trees on your Christmas table. I know you have seen these all over Pinterest, but I still find them adorable. Of course there are many more ways to use bottle brush trees, but this should help get you started. Where do you find them? I do have a few left in my shop if you are looking for the kind with the ornaments already on them. I’ve got a special on my book this week. I Just bleached a few trees and read your post. What a “duh” moment as I realized that I have a terrarium almost like that one in the photo. Great idea!! Thanks. Thanks for ideas. I love your bottle brush trees . 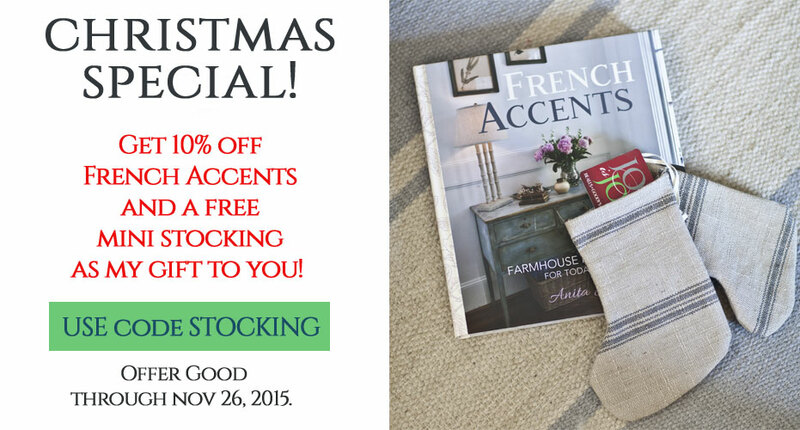 You’re an Outlander fan! Just one more reason to love your blog!! Love the bottle brush trees and wished I had still saved my mine. My Dad used to work in the Fuller Brush Brush Company in East Hartford CT and brought them home to us….maybe they disappeared along the moves.. 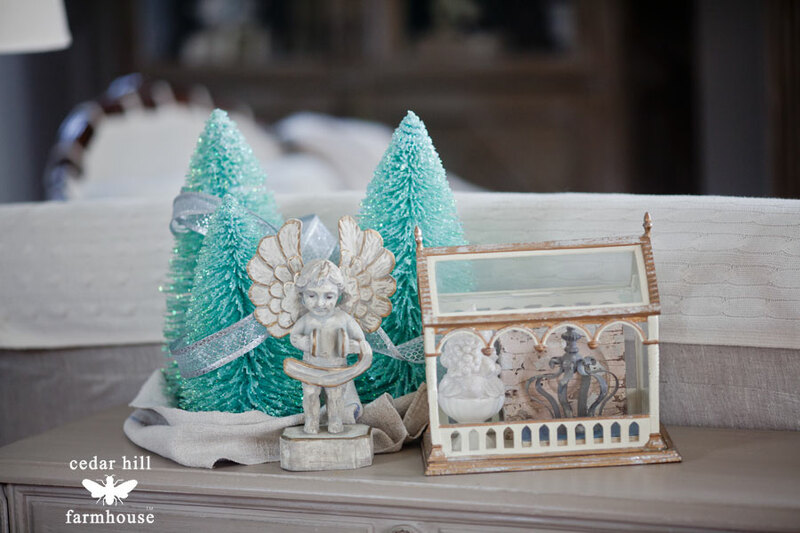 However I do have one that has resided in my daughter’s dollhouse for 40 years and we are in the process of restoring that house and I will add more more glitter to that Christmas tree! My father built that dollhouse and my mother did the decorating, now my husband and I are adding some of our touches (like updating the avocado appliances to stainless steel!!!!!etc. LOLOSo fun! Oh wow, and too funny on the appliances in the dollhouse!! I have collected bottle brush trees for several years. I like to tuck them into bookshelves or small ones on a wreath. I love that you are an Outlander fan , I have read the books since they first came out. I’m looking forward to season 3, I want to see Claire walk into the print shop. Another Outlander fan! Just one more reason to like your blog! Yay Margaret! Can’t wait for Season 3. 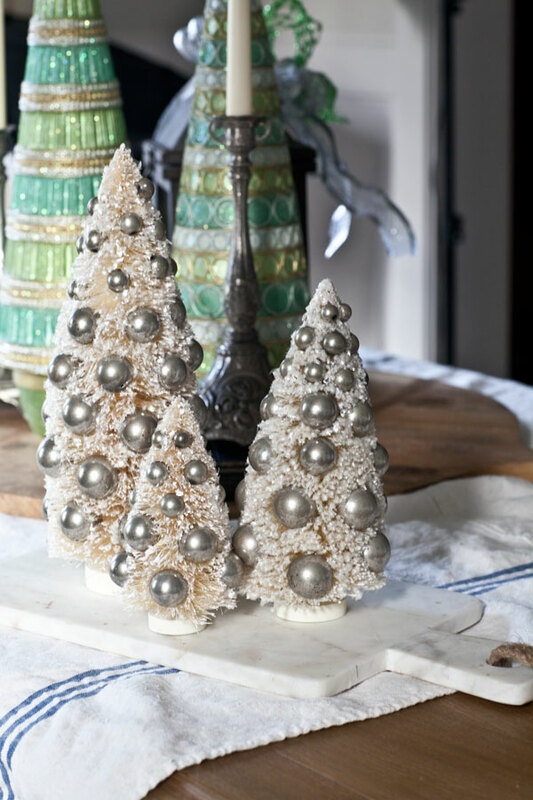 I love to use the bottle brush trees for decorating! They are so cute! I have used them in my Christmas Village Set. I have put little lights on some of the bigger trees. 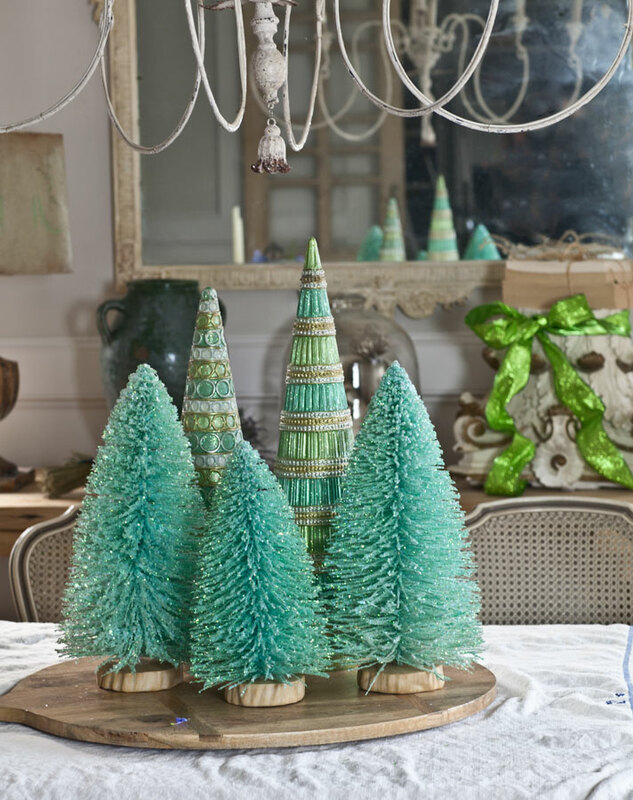 These little bottle brush trees have wormed their way into my heart and decor this year. Don’t know why… I used to associate them with all things old fashioned and out-dated. I guess the saying is true, “Everything old is new again”. Thanks for the ideas.